For specific light rail systems, many of which use the words "light rail" as part of their name, see List of tram and light rail transit systems. Light rail, light rail transit (LRT) or fast tram is urban public transport using rolling stock similar to a tramway, but operating at a higher capacity, and often on an exclusive right-of-way. The term light rail was coined in 1972 by the U.S. Urban Mass Transportation Administration (UMTA; the precursor to the Federal Transit Administration) to describe new streetcar transformations that were taking place in Europe and the United States. In Germany the term Stadtbahn (to be distinguished from S-Bahn, which stands for Stadtschnellbahn) was used to describe the concept, and many in the UMTA wanted to adopt the direct translation, which is city rail (the Norwegian term, bybane, means the same). However, the UMTA finally adopted the term light rail instead. Light in this context is used in the sense of "intended for light loads and fast movement", rather than referring to physical weight. The infrastructure investment is also usually lighter than would be found for a heavy rail system. 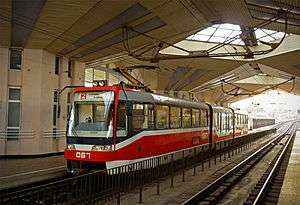 However, some diesel-powered transit is designated light rail, such as the O-Train Trillium Line in Ottawa, Canada, the River Line in New Jersey, United States, and the Sprinter in California, United States, which use diesel multiple unit (DMU) cars. The difference between British English and American English terminology arose in the late 19th century when Americans adopted the term "street railway", rather than "tramway", with the vehicles being streetcars rather than trams. Some have suggested that the Americans' preference for the term "street railway" at that time was influenced by German emigrants to the United States (who were more numerous than British immigrants in the industrialized Northeast), as it is the same as the German term for the mode, Straßenbahn (meaning "street railway"). A further difference arose because, while Britain abandoned all of its trams except Blackpool after World War II, seven major North American cities (Toronto, Boston, Philadelphia, San Francisco, Pittsburgh, Newark, and New Orleans) continued to operate large streetcar systems. When these cities upgraded to new technology, they called it light rail to differentiate it from their existing streetcars since some continued to operate both the old and new systems. 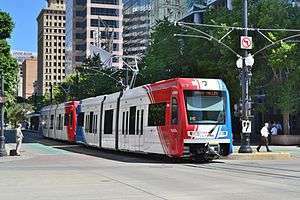 Since the 1980s, Portland, Oregon, has built all three types of system: a high-capacity light rail system in dedicated lanes and rights-of-way, a low-capacity streetcar system integrated with street traffic, and an aerial tram system. SEPTA's 101 trolley pulling into 69th Street Terminal. A more modern variation, where the trains tend to run along their own 50' right-of-way and are often separated from road traffic. Stops are generally less frequent, and the vehicles are often boarded from a platform. Tracks are highly visible, and in some cases significant effort is expended to keep traffic away through the use of special signaling, level crossings with gate arms, or even a complete separation with non-level crossings. At the highest degree of separation, it can be difficult to draw the line between light rail and metros, as in the case of Wuppertal's Schwebebahn hanging rail system, a branch of Boston's Green Line, or London's Docklands Light Railway, which would likely not be considered "light" were it not for the contrast between it and the London Underground; many consider these not to be "light rail" lines but light metros. However, in Europe, the term light rail is increasingly used to describe any rapid transit system with a fairly low frequency or short trains compared to heavier mass rapid systems such as the London Underground or Singapore's Mass Rapid Transit. For instance, the LRT-1 and MRT-3 in Manila are often referred to as "light rail", despite being fully segregated, mostly elevated railways. This phenomenon is quite common in Chinese cities, where elevated light metro lines in Shanghai, Wuhan, and Dalian are called light rail lines. In North America, such systems are not considered light rail. In some areas, light rail may also refer to any rail line with low speeds or many stops in a short distance. This inherits the old definition of light railway in the UK. 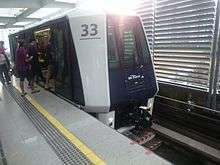 Hong Kong's Light Rail is an example of this, although it is also called "light rail" because it is a lower scale system than the rest of the MTR. Sprinter in the San Diego area uses DMUs and is targeted towards a commuter rail audience; however, because of the large number of stops along the line, it is called light rail. Reference speed from major Light rail system is shown below. However, low top speed is not always a differentiating characteristic between light rail and other systems. For example, the Siemens S70 LRVs used in the Houston METRORail and other North American LRT systems have a top speed of 106 kilometres per hour (66 mph) while the trains on the all-underground Montreal Metro can only reach a top speed of 72 kilometres per hour (45 mph). 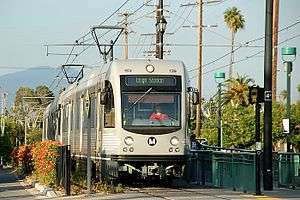 Los Angeles Metro light rail vehicles have higher top and average speeds than Montreal Metro or New York Subway trains. The main difference is that Montreal Metro and New York Subway trains carry far more passengers than any North American LRT system, and the trains have faster acceleration, making station-to-station times relatively short in their densely populated urban areas. Most light rail systems serve less densely populated cities and suburbs where passenger traffic is not high, but low cost combined with high top speed may be important to compete with automobiles. Many light rail systems—even fairly old ones—have a combination of both on- and off-road sections. In some countries (especially in Europe), only the latter is described as light rail. In those places, trams running on mixed rights-of-way are not regarded as light rail, but considered distinctly as streetcars or trams. However, the requirement for saying that a rail line is "separated" can be quite low—sometimes just with concrete "buttons" to discourage automobile drivers from getting onto the tracks. Some systems such as Seattle's Link are truly mixed but closed to traffic, with light-rail vehicles and traditional buses both operating along a common right-of-way. Many original tram and streetcar systems in the United Kingdom, United States, and elsewhere were decommissioned starting in the 1950s as the popularity of the automobile increased. Britain abandoned its last tram system, except for Blackpool, by 1962. Although some traditional trolley or tram systems exist to this day, the term "light rail" has come to mean a different type of rail system. Modern light rail technology has primarily West German origins, since an attempt by Boeing Vertol to introduce a new American light rail vehicle was a technical failure. After World War II, the Germans retained their streetcar networks and evolved them into model light rail systems (Stadtbahnen). Except for Hamburg, all large and most medium-sized German cities maintain light rail networks. Historically, the track gauge has had considerable variations, with narrow gauge common in many early systems. However, most light rail systems are now standard gauge. Older standard-gauge vehicles could not negotiate sharp turns as easily as narrow gauge ones, but modern light rail systems achieve tighter turning radii by using articulated cars. An important advantage of standard gauge is that standard railway maintenance equipment can be used on it, rather than custom-built machinery. Using standard gauge also allows light rail vehicles to be moved around, conveniently using the same tracks as freight railways. Another factor favoring standard gauge is that accessibility laws are making low-floor trams mandatory, and there is generally insufficient space for wheelchairs to move between the wheels in a narrow-gauge layout. Furthermore, standard gauge rolling stock can be switched between networks either temporarily or permanently and both newly built and used standard gauge rolling stock tends to be cheaper to buy, as more companies offer such vehicles. The table below illustrates the capacity of a light rail train (the Siemens S70) compared to that of a standard car with five seats. The average length of a standard five-seat car is about 4.74 metres. The length of a Siemens S70 light rail vehicle is 27.7 meters, approximately the same length as 5.8 cars. The maximum occupancy of a car is five people. The maximum capacity of the Siemens S70 is 220 people. This means that one metre in a car has a capacity of one person and one metre in a light rail vehicle has a capacity of almost eight persons, so the capacity of light rail is about eight times higher than that of a car, if only the length of the vehicles is taken into consideration. The average width of an automobile is about 1.77 metres, while the average width of the Siemens S70 is about 2.7 metres. The area of a car is about 8.4 m², while the area taken up by a light rail car is about 74.8m². In a car, each square metre has room for only 0.6 persons, while each square metre in a light rail car has room for 2.9 persons. This means that a light rail is significantly more capacity-effective than a car. Height is not taken into consideration, because it is not normally a problem given minimum-clearance regulations for underpasses. Energy efficiency for light rail may be 120 passengermiles per gallon of fuel (or equivalent), but variation is great, depending on circumstances. While the table above compares the maximum capacity of each mode, the average use of a lane might be quite different, based on a number of factors. One line of light rail (requires 25' Right of Way) has a theoretical capacity of up to 8 times more than one 12' lane of freeway (not counting buses) during peak times. Roads have ultimate capacity limits that can be determined by traffic engineering. They usually experience a chaotic breakdown in flow and a dramatic drop in speed (colloquially known as a traffic jam) if they exceed about 2,000 vehicles per hour per lane (each car roughly two seconds behind another). Since most people who drive to work or on business trips do so alone, studies show that the average car occupancy on many roads carrying commuters is only about 1.5 people per car during the high-demand rush hour periods of the day. This combination of factors limits roads carrying only automobile commuters to a maximum observed capacity of about 3,000 passengers per hour per lane. The problem can be mitigated by introducing high-occupancy vehicle (HOV) lanes and ride-sharing programs, but in most cases the solution adopted has been to add more lanes to the roads. Most light rail systems in the United States are limited by demand rather than capacity (by and large, most North American LRT systems carry fewer than 4,000 persons per hour per direction), but Boston's and San Francisco's light rail lines carry 9,600 and 13,100 passengers per hour per track during rush hour. Elsewhere in North America, the Calgary C-Train and Monterrey Metro have higher light rail ridership than Boston or San Francisco. Systems outside North America often have much higher passenger volumes. The Manila Light Rail Transit System is one of the highest capacity ones, having been upgraded in a series of expansions to handle 40,000 passengers per hour per direction, and having carried as many as 582,989 passengers in a single day on its Line #1. It achieves this volume by running four-car trains with a capacity of up to 1,350 passengers each at a frequency of up to 30 trains per hour. However, the Manila light rail system has full grade separation and as a result has many of the operating characteristics of a metro system rather than a light rail system. A capacity of 1,350 passengers per train is more similar to heavy rail than light rail. While many claim that light rail is safe, research by car bloggers suggest otherwise. For example, an analysis of data from the 505-page National Transportation Statistics report  published by the US Department of Transportation shows that light rail fatalities are higher than all other forms of transportation except motorcycle travel (31.5 fatalities per 100 million miles). By comparison, a freeway lane expansion typically costs $1.0 million to $8.5 million per lane mile for two directions, with an average of $2.3 million. However, freeways are frequently built in suburbs or rural areas, whereas light rail tends to be concentrated in urban areas, where right of way and property acquisition is expensive. Similarly, the most expensive US highway expansion project was the "Big Dig" in Boston, Massachusetts, which cost $200 million per lane mile for a total cost of $14.6 billion. Since a light rail track can carry up to 20,000 people per hour as compared with 2,000–2,200 vehicles per hour for one freeway lane, light rail is comparable in construction cost to freeways on a per passenger-mile basis. For example, in Boston and San Francisco, light rail lines carry 9,600 and 13,100 passengers per hour, respectively, in the peak direction during rush hour. Combining highway expansion with LRT construction can save costs by doing both highway improvements and rail construction at the same time. As an example, Denver's Transportation Expansion Project rebuilt interstate highways 25 and 225 and added a light-rail expansion for a total cost of $1.67 billion over five years. The cost of 17 miles (27 km) of highway improvements and 19 miles (31 km) of double-track light rail worked out to $19.3 million per highway lane-mile and $27.6 million per LRT track-mile. The project came in under budget and 22 months ahead of schedule. However, Calgary's LRT ridership is much higher than any comparable US light rail system, at 300,000 passengers per weekday, and as a result its capital efficiency is also much higher. Its capital costs were one-third those of the San Diego Trolley, a comparably sized US system built at the same time, while by 2009 its ridership was approximately three times as high. Thus, Calgary's capital cost per passenger was much lower than that of San Diego. Its operating cost per passenger was also much lower because of its higher ridership. A typical C-Train vehicle costs only $163 per hour to operate, and since it averages 600 passengers per operating hour, Calgary Transit estimates that its LRT operating costs are only 27 cents per ride, versus $1.50 per ride on its buses. Compared to buses, costs can be lower due to lower labor costs per passenger mile, higher ridership (observations show that light rail attracts more ridership than a comparable bus service) and faster average speed (reducing the amount of vehicles needed for the same service frequency). While light rail vehicles are more expensive to buy, they have a longer useful life than buses, sometimes making for lower life-cycle costs. Around Karlsruhe, Kassel, and Saarbrücken in Germany, dual-voltage light rail trains partly use mainline railroad tracks, sharing these tracks with heavy-rail trains. In the Netherlands, this concept was first applied on the RijnGouweLijn. 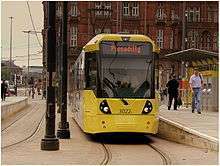 This allows commuters to ride directly into the city centre, rather than taking a mainline train only as far as a central station and then having change to a tram. In France, similar tram-trains are planned for Paris, Mulhouse, and Strasbourg; further projects exist. In some cases, tram-trains use previously abandoned or lightly used heavy rail lines in addition to or instead of still in use mainline tracks. There is a history of what would now be considered light-rail vehicles operating on heavy-rail rapid transit tracks in the US, especially in the case of interurban streetcars. Notable examples are Lehigh Valley Transit trains running on the Philadelphia and Western Railroad high-speed third rail line (now the Norristown High Speed Line). Such arrangements are almost impossible now, due to the Federal Railroad Administration refusing (for crash safety reasons) to allow non-FRA compliant railcars (i.e., subway and light rail vehicles) to run on the same tracks at the same times as compliant railcars, which includes locomotives and standard railroad passenger and freight equipment. Notable exceptions in the US are the NJ Transit River Line from Camden to Trenton and Austin's Capital MetroRail, which have received exemptions to the provision that light rail operations occur only during daytime hours and Conrail freight service only at night, with several hours separating one operation from the other. The O-Train Trillium Line in Ottawa also has freight service at certain hours. When electric streetcars were introduced in the late 19th century, conduit current collection was one of the first ways of supplying power, but it proved to be much more expensive, complicated, and trouble-prone than overhead wires. When electric street railways became ubiquitous, conduit power was used in those cities that did not permit overhead wires. In Europe, it was used in London, Paris, Berlin, Marseille, Budapest, and Prague. In the United States, it was used in parts of New York City and Washington, DC. Third rail technology was investigated for use on the Gold Coast of Australia for the G:link light rail, though power from overhead lines was ultimately utilized for that system. 1 2 "Fact Book Glossary - Mode of Service Definitions". American Public Transportation Association. 2015. Retrieved 2015-01-06. ↑ "National Transit Database Glossary". U.S. Department of Transportation Federal Transit Administration. 18 October 2013. Retrieved 2015-01-06. ↑ "What is light rail?". Public transport A-Z. International Association of Public Transport. 2008. Archived from the original on 13 October 2008. Retrieved 2015-07-29. ↑ "This Is Light Rail Transit" (PDF). Transportation Research Board. pp. 7–9. Retrieved 2015-01-06. ↑ "What is Light Rail?". Light Rail Transit Association (LRTA). Retrieved 2015-01-06. ↑ Gregory L. Thompson (2003), Defining an Alternative Future: Birth of the Light Rail Movement in North America (PDF), Transportation Research Board. ↑ "Tram (definition)". Merriam-Webster Online Dictionary. Retrieved 2007-07-18. ↑ "The Yesterland Hotel Tram". Yesterland.com. Retrieved 2013-02-07. ↑ "Trolley (definition)". Merriam-Webster Online Dictionary. Retrieved 2007-07-18. ↑ "Light Rail Transit". Encyclopædia Britannica. Retrieved 2007-07-18. ↑ Smiler, Simon P. "Trams, Streetcars and Light Rail Vehicles". citytransport.info. Retrieved 2007-07-18. ↑ Plous, Jr, F.K. (June 1984). "A Desire Named Streetcar". Planning. American Planning Association. Archived from the original on 3 March 2006. Retrieved 2007-08-14. ↑ "Light Rail Schedule Speed – Faster Than Bus, Competitive With Car". ↑ "Link Light Rail in the North American Context". 30 December 2009. ↑ "Welcome to Saskrailmuseum.org". Saskatchewan Railway Museum. BlackNova Internet Services. 11 September 2008. Retrieved 2009-12-26. ↑ Courtenay, Peter (2006). "Trams in the UK". thetrams.co.uk. Retrieved 26 December 2009. 1 2 Bottoms, Glen (2000). Continuing Developments in Light Rail Transit in Western Europe (PDF). 9th National Light Rail Transit Conference. Portland, Oregon: Light Rail Transit Association. Retrieved 26 December 2009. ↑ Fazio, A. E.; Hickey, T. R. (2003). "Designing New Light Rail – Taking Engineering Beyond Vanilla". Circular E-C058: 9th National Light Rail Transit Conference. Transportation Research Board. Retrieved 2006-11-10. ↑ "Technical Data". Light Rail Vehicle System Houston/Texas, USA. Siemens. 2008. Archived from the original on 27 April 2008. Retrieved 2008-03-18. 1 2 "Siemens S70 Low-Floor Light Rail Vehicle" (PDF). Siemens. 1 2 "Gomaco Trolley Company". Gomaco Trolley Company. ↑ Matt Lorenz and Lily Elefteriadou (2000) A Probabilistic Approach to Defining Freeway Capacity and Breakdown (PDF), Transportation Research Board. ↑ "Highlights of the 2001 National Household Travel Survey: A-15 Vehicle Occupancy Per Vehicle Mile by Time of Day and Weekend Status". US Department of Transportation. ↑ Tom Parkinson and Ian Fisher (1996) Rail Transit Capacity, Transportation Research Board. ↑ Transit Capacity and Quality of Service Manual, Transportation Research Board. 1 2 Hanson, Susan; Giuliano, Genevieve (2004). The geography of urban transportation. Guilford Press. ISBN 1-59385-055-7. ↑ "LRT-1 sets 25-year high record ridership". Manilla Light Rail Transit Authority. 12 January 2009. Archived from the original on 26 March 2009. Retrieved 2009-03-14. ↑ "NCHRP Report 599: Default Values for Highway Capacity and Level of Service Analyses" (PDF). NATIONAL COOPERATIVE HIGHWAY RESEARCH PROGRAM. 1 2 "National Transportation Statistics 2013" (PDF). U.S. Department of Transportation. ↑ "Dissected: How're Ya Dying? Charting transportation mayhem in its many gory varieties". ↑ "Bikes on Muni". San Francisco Municipal Transportation Agency. Retrieved 2013-08-14. 1 2 "Status of North American Light Rail Projects". Light Rail Now. 2002. Retrieved 2006-11-23. ↑ "Link Light Rail Projects". Sound Transit (Central Puget Sound Regional Transit Authority). 2006. Archived from the original on 2006-11-17. Retrieved 2006-11-23. ↑ "Highway Construction Cost Comparison Survey Final Report" (PDF). Washington State Department of Transportation. April 2002. p. 3. Archived from the original (PDF) on 2009-09-05. ↑ Shaw, Mark (May–June 2006). "Reinventing a Corridor: Denver's T-REX project nears completion after five years". Constructor. McGraw-Hill Construction. Archived from the original on 19 October 2006. Retrieved 2006-11-20. ↑ Flynn, Kevin (17 November 2006). "T-REX trains ready to roll". Rocky Mountain News (Denver, CO). Retrieved 2006-11-20. 1 2 McKendrick; et al. (2006). "Calgary's C-Train – Effective Capital Utilization" (PDF). Joint International Light Rail Conference, St. Louis, Missouri. Calgary Transit. Retrieved 2008-02-11. ↑ "LRT technical data". Calgary Transit. 2006. Retrieved 2006-10-14. ↑ Post, Robert C. (2007). Urban Mass Transit: The Life Story of a Technology. Greenwood Press. pp. 45–47. ISBN 0-313-33916-3. ↑ "Gold Coast Light Rail Feasibility Study". Commonwealth Government, Gold Coast City Council & Queensland Government Queensland Transport. 23 December 2004. ↑ "Bordeaux Light Rail Route Will Operate Without Overhead Lines" (Press release). American Public Transportation Association. 2003. Archived from the original on 1 December 2008. Retrieved 2007-12-21. ↑ "99% AVAILABILITY AND EXCEPTIONALLY HIGH PASSENGER LEVELS : THE BORDEAUX URBAN TRAMWAY IS A RESOUNDING SUCCESS". Railway-Technology.com. Net Resources International. Archived from the original on 2008-06-13. Retrieved 2009-12-26. Wikimedia Commons has media related to Light rail.